Since its first performances around 1596 and its earliest editions (1597, 1599), Romeo and Juliet has remained one of Shakespeare's most popular plays. The reasons are not far to seek, as the play centers on a subject of perennial interest: romantic love. A mixed genre, the play begins as a comedy and ends as a tragedy. Romeo and Juliet are among Shakespeare's most memorable characters, for he has endowed them with some of his greatest lyric poetry. Students and scholars continue to debate whether the death of the two lovers is a tragedy of fate, or whether Romeo and Juliet are responsible for what happens to them, like so many of Shakespeare's later protagonists. The lovers do all they can to escape the violence in Verona, and Friar Lawrence hopes that their marriage will end the feud between their families. But events prove beyond their means of control, and rather than submit to Verona's traditions of hatred and violence, Romeo and Juliet choose to end their lives. Ironically, their deaths bring the Capulets and Montagues to recognize their children's sacrifice and finally make peace. Taught at the high school level and studied extensively by Shakespeareans, Romeo and Juliet has attracted an enormous amount of both popular and scholarly interest. This reference book examines every aspect of Shakespeare's creation: the transformation of the story from its sources, the use of the arts of language in both prose and verse, the dramatic structure and its significance, and the most significant themes and their development. In addition, a chapter on the textual history of Romeo and Juliet reviews past and current theories, and a chapter on performances from Shakespeare's time to ours analyzes important productions both on stage and on film. Psychoanalytical, feminist, and gender criticism are also considered as alternative critical approaches along with myth and archetypal criticism. Finally, the volume contains a current selected, annotated bibliography. 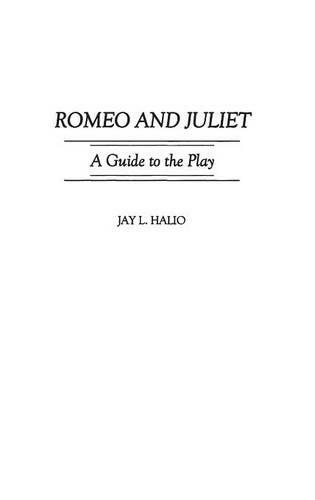 Thus the book is the fullest and most comprehensive account of Romeo and Juliet to appear in years and is of value both to students approaching the play for the first time and to scholars seeking a lucid synthesis of recent information.